Have you ever felt lost, and then found a sign that you’re on the right path? As you might know, I love to climb tall mountains, and for years have been pursuing a goal to climb the tallest ones in the USA – mountains over 14,000 feet in elevation. It is taking me years to achieve this goal as I live in Iowa, where the highest point is 1,670 feet in altitude. My son Evan and I were hiking Castle Peak, the 12th tallest mountain in Colorado (elevation 14,269 feet), when we somehow got off the rocky trail around 13,200 feet altitude – well above tree line. We found ourselves in a somewhat dangerous situation, with a very steep slope to traverse, loose shale, and a unpredictable sky – all disconcerting. Every step we made across this rocky field started a rock slide beneath our feet. I became increasingly unsettled. There was no sign of a trail, and I knew we were off course. Evan calmed me with instructions to traverse the rock field fast so the rock slides would happen behind us, not with us. I tried his technique, and it worked. What seemed like an hour of being in this unstable situation, we came upon a marvelous sight: a cairn….we were on the trail again! Ah, cairns. I have been thankful for them for many years. If you hike in the wilderness, on a remote trail, you will occasionally see piles of stones stacked on top of each other, made of natural rocks. They stick out because you can instantly tell they are not a natural formation. These small stacks of rocks are known as cairns. Cairns along hiking trails are made and maintained by hikers adding a stone when they pass, rebuilding the cairn, and marking the trail. Many times, I have lost the trail, especially in the Rocky Mountains, above tree level where there is nothing but rocks, and the trail is made of rocks on top of rocks! The occasional cairn along the way brings a big smile of relief to me. Cairns are a means of communicating…that someone has been there before you, marked the path, and is giving you reassurance – here’s the trail, you’re on it! 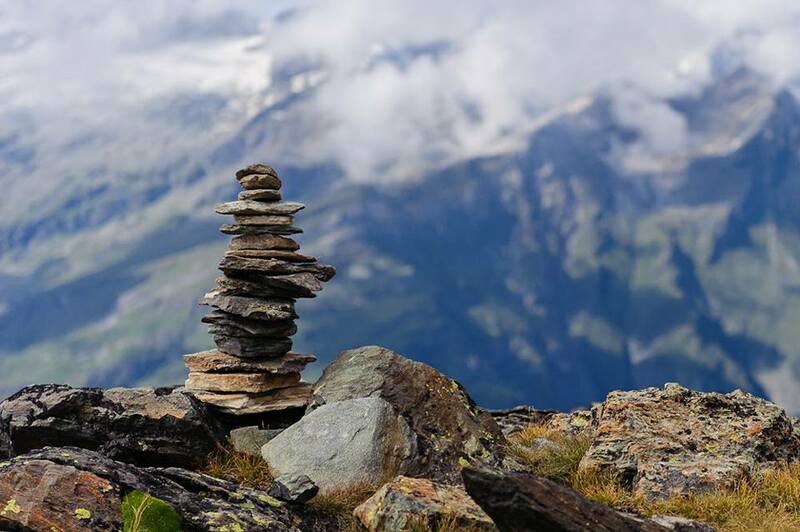 In our lives, we can build some “cairns” —contributing to the collective wisdom of other travelers on life’s way – helping others along the path. 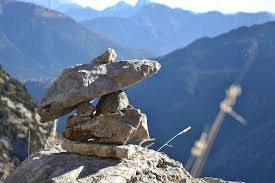 These sweet, small piles of stones, balanced like child’s building blocks, provide a picture of my purpose. I want to help others along their journey of life, and be a help when I can. I can build cairns—small markers that help point the way. And I am so very thankful for the cairns I’ve found along the way – even when I’ve thought I was lost, and found I wasn’t….I was on the right path! “‘Stand at the crossroads and look; ask for the ancient paths, ask where the good way is, and walk in it, and you will find rest for your souls’” (Jeremiah 6:16).